Lock-in a rate currently 10% lower than Eversource’s supply rate. Guaranteed rate for 20 months – No enroll fees. Meets or exceeds all state renewable energy standards. You will never be switched to a month-to-month variable rate. 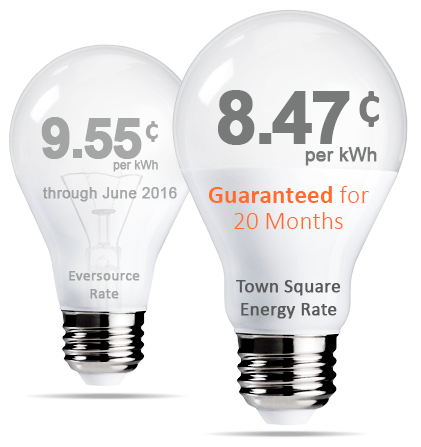 Town Square Energy is offering CT Eversource Energy customers a fixed rate of 8.47¢ per kWh that is guaranteed for 20 months. To take advantage of this offer, call Town Square Energy at 877.373.0105 or click on the link above to.